Are you looking for the most whimsical and lovely wedding invitation for your wedding? Well, search no further as our collection of the luscious paisley pattern wedding invitations are the most beautiful invites that fits well in all kind of wedding ceremonies. With amazing colors, designs, patterns and motifs, these amazing paisley wedding cards are simply gorgeous and irresistible. Our expertise in designing most amazing invitations is well reflected in our exuberant assortment of these stunning paisley invitations. 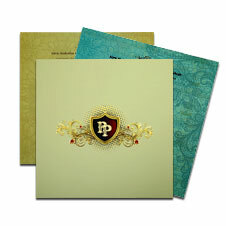 Once you browse through our rich and elegant paisley theme wedding invitations, you would love to buy them instantly. 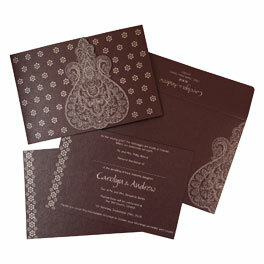 It would be a real pleasure and classy to invite all your loved ones with these paisley invitations. Along with these paisley wedding cards, at 123WeddingCards we offer a wide range of exclusive and designer box cards that are artistically designed by our expert designer team. Every card in our collection has unique pattern, design and adornment that leave everyone spellbound. Embedded with rich designs and made with finest quality paper & unique processes, all our wedding invites are lovely. We also offer a vast array of matching wedding stationery & add-on cards. You can match all these with designer cards, paisley wedding cards, scroll cards and much more. Moreover, we offer Customization that allows you to add a personal flair in your wedding invites.